Branto Orb is a new smarthome hub that promises to serve as a single point of control for all your connected home devices. 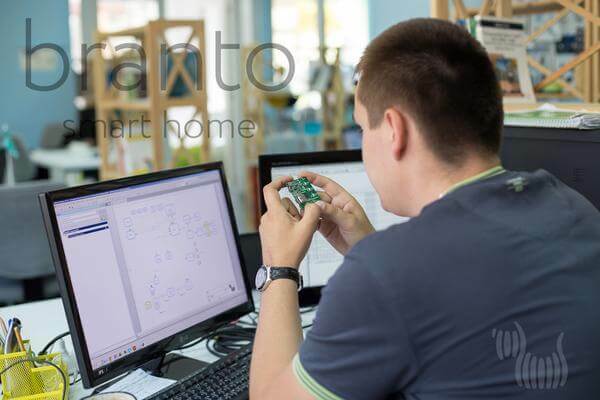 The Branto Indiegogo project launched on July 20th, 2015. We caught up with the team for an interview shortly before they kicked off their campaign. Entrepreneurs Max Mets and Nick Brogun are the founders of Branto Inc., a 26 person Ukrainian hardware startup. 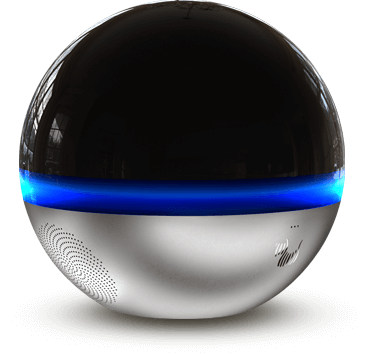 Branto Orb, their newest offering, is a next generation connected home device that follows in the footsteps of mentor Tony Fadell’s Nest line of IoT products. The Branto Orb is designed in Ukraine and Israel, and manufactured in China. Key partners include Fuzhou’s Rockchip (CPU producer) as well as Mitsumi and Broadcom (Wi-Fi modules). The Branto Orb will sell for $299. Key components include a high-speed rotating camera – full HD resolution and a 360 degrees full panorama view with infinite rotation and a low latency video connection. Core features will provide the ability to have full remote presence at your home when you’re away. You can see and speak with your child, pets, to control safety and security of your home. Branto: The CEO of Branto Inc. is Max Mets, an experienced entrepreneur who has funded companies in health, lifestyle, and architecture in Ukraine. Max began his career in tech as a project manager in software development. Our CTO is Nick Bogun. He started his career as research associate at Dnepropetrovsk National University, Ukraine. He has a number of developments in electronics, including non-destructive control, angle sensors, precision measuring equipment, robotics, and others. Tell us how Branto came about? What is your story? Our story began in the Fall of 2009. Nick was working at a company called Okulele on a project called “Walking Robot,” and was not even thinking about other priorities. In November 2009, Nick spoke to Eugene Dzygin, his classmate and the lead programmer in the company. Eugene invited Nick to meet some friends who were experimenting with startup ideas and were looking for a specialist in electronics who could help to develop an interesting idea. At that time, Nick was interested in trying out different projects, so he agreed without hesitation, despite the fact that he already had a cool and well-paying job. That first meeting took place at a restaurant, the group included Nick, Max, Eugene, Dmitry Soenko and a couple others. They were discussing different technologies and wireless management technique. The conversation turned to the creation of wireless control systems for the construction of a “smart home.” The topic was interesting, so the guys decided not to waste any time and to try to make the first prototype devices for wireless control of a conventional light bulb as the first element of their future “smart home.” Nick evaluated the work to find the right subcontractors. Where did the idea for Branto come from? Max Mets: I wanted to make a “smart home” system. I knew that this was a new and cool technology that provides a new standard for comfort and convenience. So first I did some research and tried to find all the local firms that offered smart-home solutions and reached out to personally talk with their management. I was surprised to discover that a well-equipped system for a “smart house” would cost about $50K. The sum seemed exorbitant! I knew that this was a new and cool technology that provides a new standard for comfort and convenience. So I asked one of my friends, Dmitry Soenko, a partner in a software startup, whether these systems were so complex that they required such a high price. On a blank sheet of paper, we drew up a simple system: a flash drive connected to the computer, which takes command of different consoles and systems — for example, the home lighting system. We recognized that what we were describing was a smart-home “hub” product that could be sold in stores for much less than $50k. Dmitry was confident he could develop software, but we needed an expert in electronics. As a result, we found Nick. Who did you make Branto for? Who will use Branto? We expect Branto Orb to be an affordable solution for people with household incomes of $40K or higher for renters and $50K or higher for homeowners, which is about 51% population U.S. and Canada. We’re targeting users who are 25 years of age or older, but we cite analysts at iControl Networks who found that it wasn’t the respondent’s age, gender or income level that was most predictive of their preferences, but rather their level of enthusiasm for the technology. Technology enthusiasts represent 32% of the market and are much more interested in more robust smart home solutions. What can you tell us that’s most interesting about the technology inside of Branto? Aside from its stylish design and firm housing, Branto Orb offers very strong protectability. All data is securely stored and transmitted. The device is energy/network self-sufficient. It has a complete security circuit protection system that includes a server for authentication/authorization of smart devices, smart-locks (in development), close/open sensors, motion detectors and object finders. One really nice feature is our wireless Full HD rotating camera that has a high speed/infinite rotation, 360/90 degrees cover, fine positioning capability. Overall, Branto Orb provides a simplified scalability for your smart home ecosystem — just link one device to another and you can control any device in your home. The multifunctionality of the Branto Orb is our key value add, consumers can use it as a smart home controller, a camera for monitoring, a communication device and a streaming media player. If you want to learn more about Branto Orb, you can visit the website at branto.co. You can also follow the Branto team on Twitter at @MyBranto. As always, if you have more questions or if you have tried a Branto and want to tell us about your experience, please feel free to comment below or contact us here.